Ryan Smith (R-Bidwell) serves as the state representative of the 93rd District of the Ohio General Assembly. 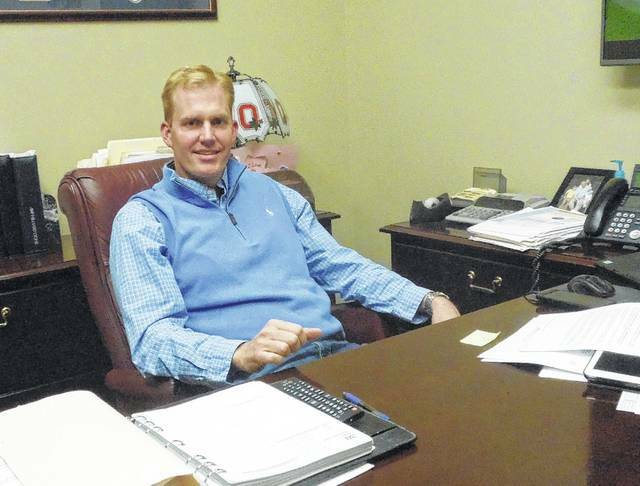 GALLIPOLIS — Bidwell resident and State Representative of the 93rd District Ryan Smith recently spoke about his bid for the Ohio General Assembly’s Speaker of the House position. Currently in the House, one-third of the representatives are Democrat and the other two-thirds are Republican. Cliff Rosenberger currently serves as the Speaker of the House. There are 99 members in the House and the majority party vote determines the Speaker. Smith’s peers in office will choose who is the next Speaker. Smith began his career in politics after running for the Gallipolis City School Board in 2007. In 2011, Representative John Carey resigned before Smith would announce his candidacy for the 2012 election. Smith would win the 2012 election and again in 2014 and 2016. Smith will be running again for office in 2018, this time with his eye on the seat of Speaker of the House. Smith said while he wanted to accomplish progress for Ohio, an essential part of that plan was bringing southeast Ohio with it. Among Smith’s concerns, perhaps one of his greatest concerns is to get southeast Ohioans well-paying jobs. While college is a road to success, Smith emphasized it was not the only road and that vocations may offer a better option to some Ohio residents when college costs are rising and fields requiring college degrees are becoming saturated. Smith said he would ideally like to make training programs more efficient. Smith said he felt the potential of natural gas extraction in southeast Ohio was also another possible job creator he would look into capitalizing on for state residents. Internet access for rural Ohioans is another priority for Smith. In regard to the opioid crisis, Smith said that with his time as Finance Chair in the House, he and his colleagues had focused on passing financial legislation in Ohio dedicated to fighting the opioid epidemic and would continue to target the problem. Smith said it was important for law enforcement to continue to receive support in fighting drug traffickers but that the key to combating the opioid epidemic was to treat it as a health problem as well. Republicans have traditionally held to the idea that government needs to be small. Smith believes the importance of government is to be efficient and as unobtrusive as possible. If Smith is elected to serve as Speaker of the House, he will be the first Gallia resident to do so in Ohio’s history. Dean Wright can be reached at 740-446-2342.